A group of scientists in the Russian Far East has developed an experimental technology that can turn waste from coal-fired power plants into precious metals. Far Eastern Federal University in Vladivostok has developed a new experimental technology that can extract gold and platinum from the ash dumps of coal-fired power plants. The new method is capable of recycling processed ash into gold, platinum and a variety of building materials, such as brick, roof tiles, insulation, masonry blocks and paving stones. According to scientists, this technology can be used throughout the world and has great economic potential. China has already expressed interest. This experimental technology entails grinding down raw materials and fully extracting valuable elements using a combination of gravitational, electromagnetic, vibrational and ultrasound treatment and flotation. The Far Eastern scientists are convinced that this technology will help address the issue of managing coal dumps and other man-made formations. According to Far Eastern Federal University, no more than six percent of the raw materials mined from the earth actually reach the consumer. The rest end up in landfills and as a result, storage facilities are filled to the brim. Ash and slag waste from energy production occupy an enormous amount of land. Russia alone has accumulated some 1.5 billion tons of ash and slag, and more than 22,000 hectares of land are contaminated by the ash and slag from heat and power plants. Environmental degradation could be greatly lessened if the new technology were put to use to treat and recycle man-made waste. The sand released in the process could be used in construction, while unburned coal could be returned to the power plant in the form of fuel. How much gold is in coal? When studying waste from power plants in the Primorsky Region, the group of scientists established that each ton contains between 0.5 and 2.5 grams of gold on average and the same amount of platinum. 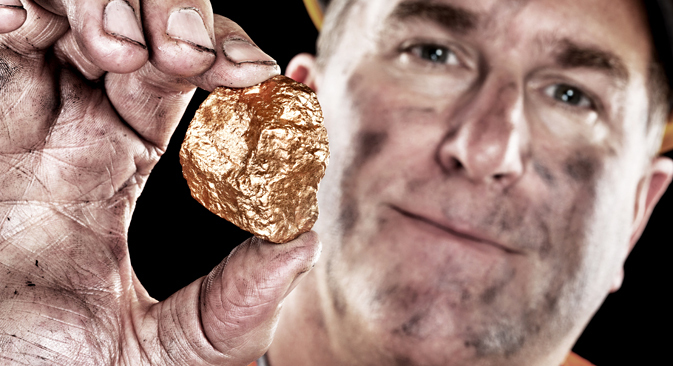 “If we were talking about extracting gold from coal, that would be unprofitable,” Taskin said. “But we’re talking about the comprehensive treatment of man-made waste from large-scale industrial production and the extraction of valuable components. This is economically beneficial. The technology can be used throughout the world and adapted to the nuances of different regions.” There has already been interest in the technology in China, where three quarters of electricity is generated by coal-fired power plants. Surprising as it may seem, waste dumps sometimes contain a greater quantity of scarce elements than natural deposits do. The ash dumps of some heat and power plants are man-made deposits of precious metals and rare earth elements. In fact, the real value of many ash dumps is comparable with that of the entire housing stock in a large city. Scientists have proven that it can be economically efficient and environmentally safe to recycle these elements. They did so by treating waste from the second Vladivostok Combined Heat and Power Plant. From 1993 to 2002 the Far Eastern Research Institute for Construction and the Far Eastern State Technical University successfully produced building materials and items, and extracted gold and platinum concentrate from ash dumps at an experimental section of land. According to the scientists the process turned out to be highly profitable. Despite the scale of the waste problem, neither the government nor power plant owners have expressed interest in the research. Still, the developers have found an industrial partner interested in using the new technology, the Ecomet company, which is the only enterprise in the Far East that recycles ash and slag waste from state district power plants. Research is currently under way at Far Eastern Federal University’s laboratory on samples taken from ash dumps at power plants in Primorsky Region. The results will make it possible to more accurately estimate the gold contents of each coal waste storage area.